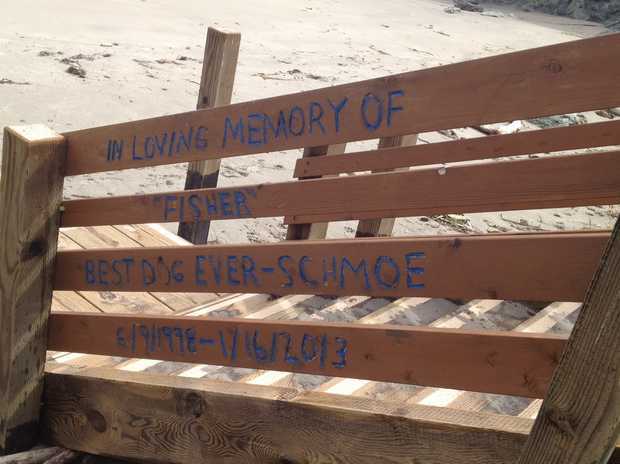 An unknown person carved and painted an epitaph to a dog called Fisher onto the Point San Luis Obispo Lighthouse beach stairs prompting the Lighthouse Keepers to ask the public to help them find the perpetrator. The stairs – built with funds from the Port San Luis Harbor District, Coastal Conservancy, and the Point San Luis Lighthouse Keepers – were vandalized with a message about a well-loved canine. “In loving memory of Fisher, best dog ever – Schmoe, 6/9/1998 – 1/6/2013,” the person wrote. The Lighthouse Keepers said they plan to have volunteers remove, replace and re-stain the 16 foot boards. OOOoooo, 4 sticks scabbed onto a couple of six by sixes. The humanity, the outrage, and in other news county and state employees rob the taxpayers blind. In the world of carpentry we call this wood butchery, and I don’t mean the graffiti. Two hour fix. Wow Max talk about missing the point. Do you think that the “other news county and state employees rob the taxpayers blind” people one day woke up and decided to steal? No it started small, with a lack of education. This idiot who carves with disregard has a attitude that carry’s over to the “day job” whatever that is. This attitude is why we can not have nice things.